Percussionist Jane Boxall is "in a genre of one," according to Burlington-VT magazine SevenDays. 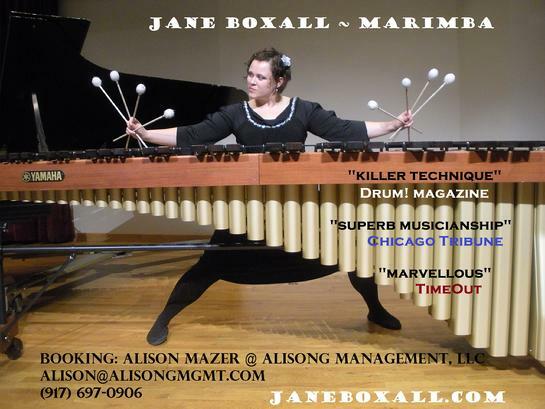 Jane plays contemporary-classical marimba repertoire with 0 to 8 mallets. In the jazz realm, Jane recreates the ragtime sounds of the 1920s on a vintage instrument. Chamber-music collaborations range from Ricochet Duo's fresh piano-marimba repertoire to music for keyboard percussion and choir. Audience members have compared Jane to Cozy Powell, Evelyn Glennie, Zappa marimbist Ruth Underwood, Sheila E., Carl Palmer and (when wielding 8 mallets) an octopus. High-resolution photos for media and promotional use. Click the thumbnail for the full-size photo. To request other photo files, email jane.